What to do with leftover ripe bananas and french bread? Why not stuffed french toast? This recipe is pretty easy to follow. The only complaint I received from my guests was that the bananas were too ripe and therefore I could have used less. But, I’m a banana aficionado so it didn’t bother me in the least bit. I did make 1 1/2 times the batter (already shown below) as otherwise it wouldn’t have been enough. Lightly spray a cast iron or an ovenproof skillet with cooking spray and then heat over medium heat. Place remaining four slices on top to make a sandwich. In a bowl, whisk together the milk, eggs, vanilla and cinnamon. 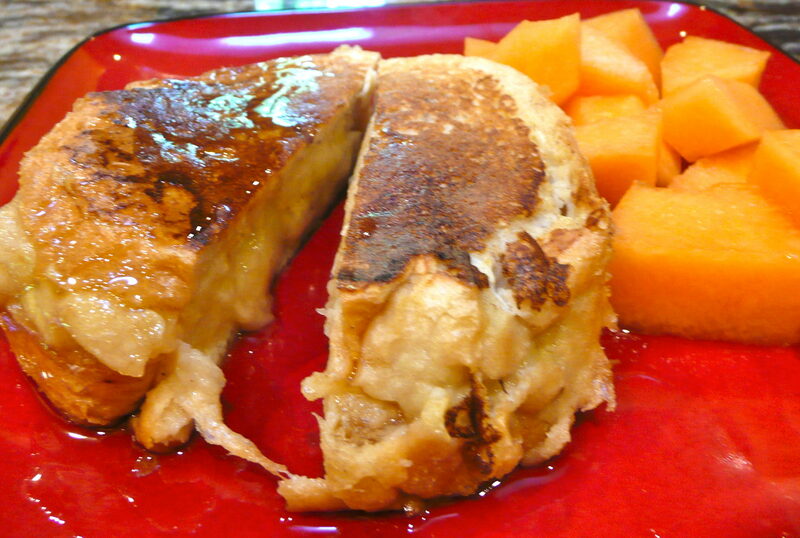 Dip the bread in the egg batter for about 30 seconds on each side then place the banana sandwich in the skillet. Cook each side for approximately two minutes. Place bread on an ungreased baking sheet and bake in a preheated oven for 8 minutes. Serve warm. I added maple syrup on top of this french toast but I didn’t really need to. It tasted fine without anything on it. Next time though, I think a nice strawberry or blueberry compote on top would make it taste even better.